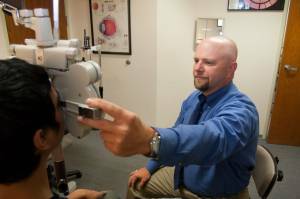 When I ran a contact lens clinic, my teaching partner and I developed a rigorous curriculum for the students to study, named “The Winnick Clinic Manual.” The manual was an extensive binder of resources around specialty contact lens fitting, and the students were assigned chapters to study and given weekly quizzes on the material. Years later, I occasionally run into past students at national meetings, and it’s rewarding when they tell me that they still refer to their “Winnick Clinic” manuals when they have contact lens questions. I enjoy teaching students perspectives about their chosen profession that they don’t have access to through their traditional full time faculty members. The students are enthusiastic about learning as much as they can, and I appreciate the opportunity to talk to them as a guest lecturer, especially around the topic of managed vision care, an area that I've gained a lot of experience in through my involvement with Vision Service Plan (VSP). Outside clinical care, I spend the majority of my time with VSP. I’ve worked with the organization for about eight years, and have served on their Board of Directors for five years. My current role is as a State Professional Representative, which serves as a local OD resource for questions about the company’s programs. Each year, VSP gives millions of dollars to charitable programs through their Eyes of Hope division. Programs include eyewear donations, mobile eye clinics for community events and disaster relief, gift certificates for children to provide free eye care and eyewear, and scholarship funds. Many of our patients at Brookside are insured by VSP, and this inspired me to get involved with the organization to help improve the system from the inside out and create a better experience for both patients and doctors. Similar to my teaching experience at UC Berkeley, I enjoy speaking and working with other optometrists to help them better understand the managed vision care system and deliver the best possible outcomes to their patients—this makes their practices more successful. For the last three summers, I’ve had the opportunity to work with VSP as an instructor for a one-week course at Sacramento State University. I developed and deliver a course for 6th through 9th grade students called “The Human Eye: Surgeries, Sight and Spectacles.” We cover everything from different eye diseases and cow eye dissections, to all the parts of an eye exam and how glasses are made. It’s fun to introduce kids at that age to the vision sciences and to hear that some of them want to pursue careers in the field after they take the class. My specialty area of practice is “Cornea and Contact Lenses,” and I completed a post-graduate residency in that area. I also went on to become a "Diplomate in Cornea, Contact Lenses & Refractive Technologies" through the American Academy of Optometry, a status that only a small number of Academy members achieve. I chose contact lenses as a specialty because it was applicable to working in a private practice setting, and also concentrated on disorders of the front of the eye which optometrists often encounter and treat. The most rewarding part of my job is giving people the best vision possible. In specialty work, it’s important to have the experience, resources, and skill set to offer the patient explanations and options that weren’t offered to them before. It’s meaningful for me to help special needs patients achieve best corrected visual acuity that allows them to maintain their general or commercial drivers licenses. The ability to drive is directly related to independence for patients, and losing that ability can result in the loss of a job. Meeting a patient who lost their driver’s license because they could not pass the vision test and having the opportunity to fit them in contact lenses that restore independence to their life is very rewarding for me. Any optometrist can fit and prescribe contact lenses, but when you have specialty needs, working with a doctor who has the right tools can make all the difference.